This weekend, I went to the first exhibition I’ve visited since the birth of my son; appropriately enough, the exhibition was “Children’s Lives”, which has recently opened at Birmingham Museum and Art Gallery. This is a fascinating exhibition about the lives of children from around the mid-18th century to the present day, and it considers a range of aspects which impact on children’s lives. The exhibition is arranged around the themes of different aspects of children’s lives, such as Home, Street, Work, Orphanage, School, Creativity, etc. There are a huge number of photographs of children and their activities, many of them Birmingham-related, as well as other documents, toys, feeding equipment and so on. The exhibition takes care to demonstrate what childhood is like for a wide range of children, from those in wealthy families, cared for by nannies, to those in the poorest families with few toys and the need to go out to work as young as possible. Many of the photographs depict irrepressibly happy children, even those who are dirty and playing in the street with no toys; but the exhibition takes care not to neglect the sadder side of childhood – neglect, poverty and so on. There are also some tragic accounts of the deaths of very young children and babies. The effects of war and evacuation are also shown. 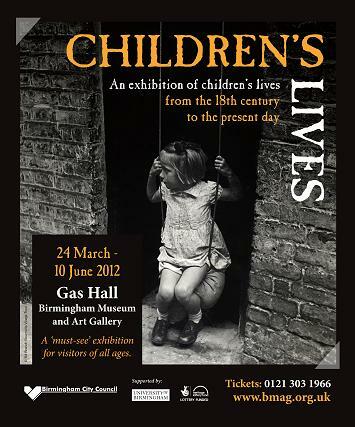 This is a fascinating exhibition, which paints a rich picture of the lives of children, particularly in Birmingham, over the last two centuries, but at times it does feel as though it’s trying to cover too much ground; there is so much to take in, and so many aspects covered, that it becomes a little confusing. Nonetheless, in its insightful images and discussion of the history of children’s lives – an often neglected subject – it’s well worth a visit. Many thanks. I love exhibitions like this one. It is good to hear that as well as photographs of children, the exhibition used other documents, toys, feeding equipment etc. I say this for the obvious reason – that in the mid-18th century there was no photography. But also because in the early days of photography, only middle class families could afford to go to a studio. To look at the lives of children in orphanages, factories and working class homes, the wider the range of evidence.. the better.